Today's Boston Herald reported on this tongue-in-cheek exchange following Saturday's 3-3 comeback tie with UMass. During that same postgame interview, Parker spotted UMass coach Don Cahoon in the back of the room waiting for his turn at the podium. “That game obviously should have been in the bag for UMass if they had any kind of coaching at all,” quipped Parker as he glanced toward his former assistant. 2008 prospect Kieran Millan, a standout goalie for the Spruce Grove Saints of the AJHL, is visiting BU and should be at tonight's game at Agganis Arena. Millan returns to Alberta this weekend to participate in the league all-star game. Two weeks ago Corey Trivino marked his 17th birthday with a 2 goal, 3 assist game for Stouffville/OPJHL. Perhaps his coaches put birthday cake on the menu again tonight as Trivino registered his first hattrick of the season and, for good measure, assisted on the game-winner in the Spirit’s 6-5 come from behind win over Ajax, 6-4. Trivino now has 23-33-56 in 45 games, and 8-6-14 in his past 5 games for the streaking Spirit. 2007 recruit Nick Bonino continues to lead Avon Old Farms in scoring and added 3 goals and 5 assists in three games this past week. His 16-24-40 line in 17 games puts him 6th in the New England Prep scoring race. The transition from college to pro hockey started slowly for John Laliberte. The team that drafted him, Vancouver, didn’t offer a contract, nor did Colorado after Laliberte had a decent free agent tryout. He landed in Trenton, a franchise that has always been friendly to college players, and just completed a strong first half that took him to the ECHL all-star game, where he joined another ex-Terrier, Ken Magowan, now skating for the Toledo Storm. New England Hockey Journal tracks John's progress. Jeff Howe will run throughout the game from Conte Forum. .. And, as always, you can listen live to Bernie Corbett and Tom Ryan's play-by-play on the radio or online. The BU site also links to CSTV's game tracker. Friday night's rematch at Agganis is on NESN in New England and SportsNet New York in the New York Metro area. All-American goalie John Curry discussed the Terriers' need for a strong second half without peaking too soon as well as his appreciation for the support of BU fans in an online chat held earlier today on CSTV.com . His name is Aces Marks and this three-year old colt was named by his Ottawa Senators scout owner, Lew Mongelluzzo, in remembrance of Mark Bavis and Ace Bailey. Details in an NHL.com feature. The second forward in BU's 2008 class is Nobles' LW Andrew Glass who verballed earlier this week. A 5-11, 180 lb junior left wing from Wrentham, Mass, he joins joins Corey Trivino and David Warsofsky in the 2008 recruit class. Glass had a strong sophomore season at Nobles, scoring 15-24-39, but injuries have limited him this season. Prior to the current prep season, he played for the Little Bruins (Jr. Bruins organization) and had 7-8-15 in 12 games. --"...his skating is his best asset...great edges and control...excellent puck skills...smart with the puck...offensive creativity"
--"really clever, nice hands, strong puck skills, has to get physically stronger, but all kids do!" Glass played in 2006 Select 17 tournament and had 4-1-5 in five games. He also participated in the in 2005 Select 16 and 2004 Select 15, and was invited to 2005 NTDP tryout camp. BU and Harvard were the finalists for Glass, who was ranked #110 by Central Scouting for N. American skaters. BC and Providence recruited him, too. Question: Besides Ferullo, which four players have worn uniform number 1 since 1990? goterriers came up with two of them--Stephen Siwiec and Scott Cashman. The other two were a bit more obscure. During the 98-99 season, the team's third goalie was David Magid, who never skated in a game. If I recall correctly, he transferred to a D3 school. The fourth goalie was Ian Arrougheti, who was a practice squad goalie during the 97-98 season when BU had just two netminders, Tom Noble and Michel Larocque, on the roster. When Noble suffered a leg injury, Arrougheti dressed as the backup to Larocque for several games and, like Magid, did not get into a game. Googling Magid reveales little information, but Arrrougheti is still actively stopping pucks in a Southern California adult league. Beyond the four points earned in Orono, BU’s sweep of Maine last weekend brought individual and team honors to the Terriers. Hockey East named John Curry Defensive Player of the Week and standout first-year defenseman Brian Strait was recognized as Rookie of the Week. Inside College Hockey chose Peter MacArthur as its Player of the Week and College Hockey News designated the Terriers as its team of the week in an article full of quotes from MacArthur. Think back to BU's last national championship team in 1995. The netminding chores, you'll recall, were shared by senior Derek Herlofsky and freshman Tom Noble. But who was the Terriers third goalie? It was Shawn Ferullo, who played just 55 minutes in eight games during his career. Today, Ferullo, a family physician in South Boston, is one of three former BU athletes who became physicians and now are involved with BU sports again, as described in the current edition of Bostonia. Terrier trivia: besides Ferullo, which four players have worn uniform number 1 since 1990? We'll post the answer later this week. Cushing Academy sophomore and BU recruit David Warsofsky is considered one of the top players in New England prep hockey and perhaps the best defenseman. Warsofsky, who turned down an invitation to join the NTDP U17s was the subject of a recent feature in New England Hockey Journal. When Warsofsky verballed to BU this past summer, USHR reported: "Warsofsky, in our opinion the most skilled defenseman in prep hockey last winter – and that as a ninth grader – is scheduled to enter BU in the fall of ’09, but look for him to accelerate his studies and arrive on Agganis Way in the fall of ’08. "Warsofsky, who’s 5’9” and 155 lbs., is a native of North Marshfield, Mass. Last season, in 37 games with the Penguins, Warsofsky had an 8-26-34 scoring line, making him one of the top-scoring defensemen in prep hockey. "Warsofsky is small, but he has excellent mobility, an excellent stick, and he sees the ice uncommonly well. He can thread the needle with his passes – a high number of them are exceptional. He has poise a-plenty. When he’s running the power play for the Terriers in a few years, those high-priced seats in the new arena will be worth every penny. He’s just a fun player to watch." David Warsofsky D, (Cushing)A tremendously talented defender .. a definite offensive defenseman with an accurate shot from the point as seen by his hat trick against Neponset Valley .. the game against Neponset Valley saw his team with a 5-on-3 advantage with 7 minutes left in the first and the first 8 minutes in the second, and David played a huge portion of that power play .. showed great patience and poise to work the puck around and wait for the best shot .. his first goal during the 5-on-3 was when he walked in from the blue line and blasted a shot beating the goalie top corner with no screen .. his second goal was a one-timer that he kept low and went right in .. the last goal he scored is when he sneaked down from the point, received a nice pass, and re-directed the puck into the net .. needs to add more strength for his defensive play and in the corners .. very vocal and displays a great talent for carry the puck. In 12 games with Cushing this season, Warsofsky has 20 points. After catching Friday nght's game the way most BU fans did - on NESN - I made the trip up to the North country for Saturday night's game. And needless to say, I was glad I did. That's two trips to Orono in two years for me, and both times I've come home happy. Here are some thoughts. - Alfond must be among the most unique venues in collegiate athletics. From outside, it looks more like a college cafeteria than a hockey arena. Once inside, you realize they have seats in every nook and cranny available. I am always amazed that the building holds over 5,000 people. At first glance, it seems more like 3,000. Anyway, the building and the atmosphere were once again a treat. - Maine's "experimental" jerseys - really not sure why new material requires such a change in design, but if nothing else, enlarge the player names on the back. The lettering looks horrible. - The net fiasco - despite all the talk in the past, it had been my impression that ever since Fields left, the net dislodging had dropped dramatically. Certainly wasn't the case Saturday. I'm not sure what the issue was with getting the pegs into the holes, but my gut tells me that it contributed to the frequency of the dislodgings. Tom Morrow was lucky that he didn't get called for delay at one point. - Maine players - Purcell looked good - no surprise he's the top freshman in the country. However, the senior leadership lacked on Saturday with Levielle and Soares taking unneccesary penalties. Bishop looked better Saturday, but still gave up a bad rebound that led to Gilroy's goal. - BU - as a team, they looked excellent in the second period Saturday, and carried it through the rest of the game. Their passes in the defensive zone were crisp. Other than Sully's slapshot from the point that led to the Ryan breakaway, they made good choices with the puck. The center on every line was in position to intercept passes into the slot, and the backchecking was inspiring. - My unsung hero for the weekend - Kevin Schaeffer. He was robbed of a goal and an assist by the refs/scorekeeper on Friday night and played solidly on Saturday. He pinched and pokechecked the puck to Yip who fed MacArthur for his second of the night, and he scored the 5th goal, not Lawrence. - My weekend MVP. Curry is an easy choice, but for the second year in a row, MacArthur picked a 2-game series with Maine to lift his game to another level and helped them take 4 points. Scoring 15 seconds after Maine did on Friday was huge, and his SH breakaway goal was the goal that really put BU in command (the late collapse notwithstanding). There is no question in my mind that he is the inspirational leader of this team. If he can continue to play at that level, BU will win games down the stretch and will make the NCAA's without having to worry on selection day. Don’t let the five goals allowed fool you. John Curry was exceptional again in the Terriers’ nail-biting 6-5 win over Maine. HockeyEastOnline’s game account of the win includes links to video of all the goals. Before the weekend series began, NHL.com's “On Campus” column looked at the achievements of BU’s best-ever walk-on. Future Terrier Corey Trivino turned 17 on Friday night and celebrated his birthday with his best performance yet in his first Junior A Season. Trivino bagged a pair of goals and three helpers in Stouffville’s 6-0 win. He now has 47 points (17g, 30a) in 41 games, second best on the Spirit....Colin Wilson scored his 18th goal of the season as the U18s lost in overtime to Traverse City. Kevin Shattenkirk, who went scoreless, was the subject of USA Hockey’s weekly NTDP feature story.... Colby Cohen had an assist for the Lincoln Stars in a 4-2 win, bringing his point total to 27 in 22 USHL games. Before joining Lincoln, Cohen had a goal and 7 assists in 12 games with the U18s. THFBlog visitors from the New York metro area will be able to watch Terrier hockey live on television tomorrow and several other Friday nights. SportsNet New York, the Mets cable station (www.sny.tv) is airing the NESN Friday Night Hockey East Game of the Week package. Tomorrow night's game is BU-Maine from Orono. The BU-BC game at Agganis is on the schedule Jan. 26, as is the Feb. 16 game at UNH. The full schedule is at HE TV. Check your local cable listings to find out what channel SNY is on. On the heels of srsterrier's informative observations of future Terriers Kevin Shattenkirk and Colin Wilson, NHL Central Scouting has issued its midterm rankings for the 2007 draft. Shattenkirk is ranked #13 among North American skaters, making him a likely first round draft choice. Wilson, whose draft year is 2008, is not ranked. Colby Cohen's stocked has soared since he made the switch from the U18s to the Lincoln Stars where he's among the USHR's top defenseman. He's ranked #27. Interestingly, BC recruit Nick Petrecki, whom some rating services had in their top ten, is ranked #31 by Central Scouting. 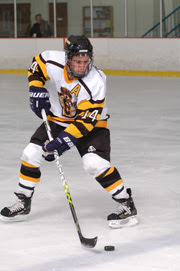 BU forward recruit Nick Bonino, a senior at Avon, is ranked #117. Chris Heisenberg's recruiting blog (see link to the right) has listed all NCAA and NCAA-bound players in the midterm ranking. To see the full list of rankings, go to http://centralscouting.nhl.com/ To log in, the username is public access . The password is hockey 2004 . Kevin Shattenkirk - the best way to describe his style of play is to compare him to a point guard in basketball. When he’s out on the ice - which is often - Shattenkirk is usually the player who skates the puck up the ice and distributes it to the forwards (not just during power plays but at even strength too). Once in the offensive zone, he usually stays up at the point. He is a smooth skater who handles the puck with ease. There was not much hesitation to his game. He seemed to always know where he wanted to pass the puck. Shattenkirk regularly creates scoring chances for his teammates (he is 5th on the team in scoring at 6-14-20 with 32 PIM in 30 games as of 12/18/06) and wound up with an assist on the power play in this game. I would not describe his shot as very hard but it is accurate. He is not very big, but a player with his skills is well-suited to the “new” NHL. He is projected as a late first-round or early second-round selection in this year’s NHL entry draft. Also: Shattenkirk wears the “C” and is clearly the team’s leader on the ice, often giving directions to teammates before draws. Colin Wilson - Wilson is 2nd on the team in scoring (16-21-37 with 25 PIM in 30 games as of 12/18/06). Although he was kept off the scoresheet for this game, he showed a lot of skill. Like Shattenkirk, Wilson gets his share of ice time. He kills penalties, plays on the power play and also takes draws. I wasn’t keeping track, but he won a number of them. Wilson has good wheels and can stickhandle the puck pretty well. With his stickhandling, he created a couple of chances. He also showed that he could play physically. Wilson is listed as 6’0, 190 lbs. but looks a little bigger than that. Because of his late birthday, Wilson will not be draft-eligible until 2008. Early projections have him going as high as the top-5. I was hoping to speak to both players after the game but there were about 500 squirts from the Stamford Youth Hockey League waiting for autographs. Wilson did give me the “thumbs up” when he saw my BU cap. As for Shattenkirk, his mom (along with several other family members and friends) was sitting near us and she said that he is very excited about the program and is looking forward to the fall. With this next class coming on board, so am I.